If you enjoyed Amrita Gurney's session at Tourism Academy, (or in case you missed it) here are her top six takeaways for impactful visual storytelling. This is a guest post from Amrita Gurney, VP of Marketing at CrowdRiff. I can still recall a time when my travel decisions were made by a combination of recommendations from Lonely Planet guidebooks, conversations with family and friends and stories from fellow travellers I met along the way. Today, however, I have even more options to influence my travel decisions. I often find myself browsing Instagram, stumbling across an enticing picture from a place I one day hope to visit and bookmarking it in my “travel” collection, which I now consult before making any of my travel plans. I’m far from alone in my social media habits; in recent years visuals have become the driving force in travel decision-making. At CrowdRiff we are increasingly focused on using data to identify which visuals are most effective in attracting and engaging travelers. At the recent Tourism Academy conference, I shared six elements that contribute to effective visual storytelling. A great image can fail to capture the imagination if not presented at the appropriate time and place. A great example of this greeted me at the airport in Louisville, Kentucky shortly after arriving for the Tourism Academy Conference in June. 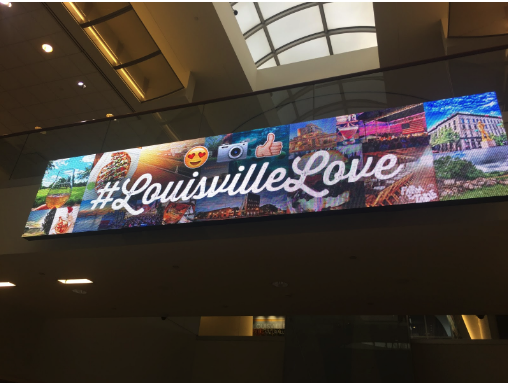 Among the first billboards I saw at the airport used a collage of user generated content with the hashtag #louisvillelove to get me excited about my upcoming stay, and inspire some of my travel decisions in the moment. 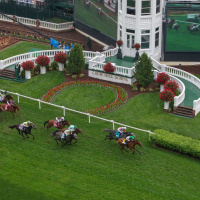 While I may not have connected with that billboard in another context, it was presented in perhaps the most relevant setting, and thus became part of my presentation about effective visual storytelling at the conference. The advertising industry doesn’t pose much of a mystery anymore. Today, consumers are hyper-aware of being marketed to, and commonly suffer from advertising fatigue. As a result, many have come to trust their peers over ads, and the most effective visual storytellers have caught on. 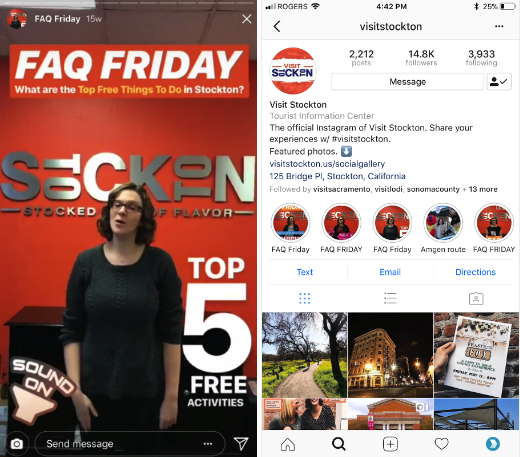 Visit Stockton uses Instagram Stories in a clever way, with their weekly FAQ Stories about what’s happening in town. These Stories are simply produced, against a vibrant orange backdrop, and feature a local team member speaking as though you were face to face at their visitor center. Another clever hack? Visit Stockton saves these Stories in their Highlights so their usefulness extends beyond the typical 24-hour timeline. When telling a visual story it’s often tempting to include a lot of different elements and text—explaining more than leaving it up to the imagination out of fear of misinterpretation—but I’ve found quality always trumps quantity. Rather than crowding images with addition layers of context, the most powerful images have a single focal point, and surround it with plenty of room to breath. This image of the Northern Lights taken from Travel Alberta’s visitor guide is a great example of a breathtaking shot that draws the viewer in without being crowding by text or supplementary images. Strong images evoke strong emotions, and it’s rare for stories of any kind to resonate without being evocative. A new video series from Visit Franklin harkens back to another era, instilling nostalgia in the viewer, in line with the destination’s Americana brand. They also break from the typical high production cinematic format of tourism videos, resulting in a refreshing, humorous and entertaining viewing experience. Effective visual storytelling doesn’t just draw you in; it immerses you in an experience, even if for just a moment. 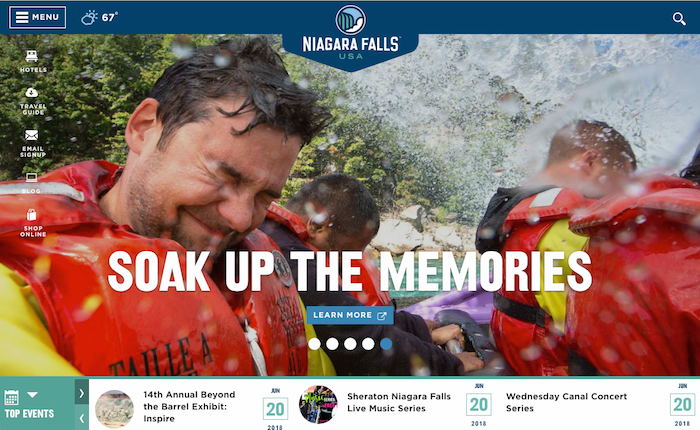 Visitors to the Niagara Falls USA website, for example, are plunged right into an immersive experience in the form of an auto-play video that places them right at the edge of the falls, followed by a quick cut to visitors getting drenched in matching yellow parkas below. The result is an immediate and overpowering experience. I doubt anyone can visit the website without their heart rate picking up pace at least a little. 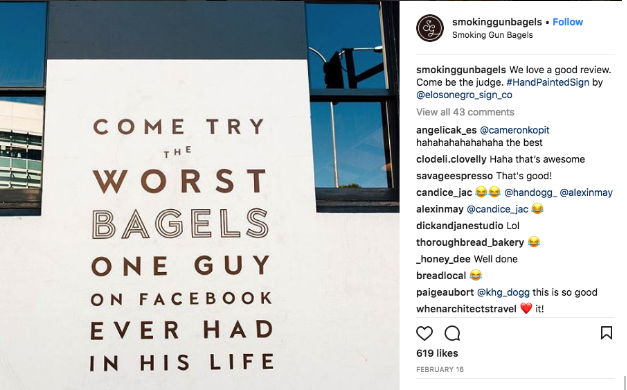 A hand painted sign on the outer-wall of the Smoking Gun bagel shop in Sydney, Australia recently went viral for its simple, self-reflexive humor. The sign read “come try the worst bagels one guy on Facebook ever had in his life.” The sign was an instant hit on social media, and gave every passerby an enticing reason to stop in and try a bagel. How did I hear about it? A cousin of a colleague posted it to her social media feed, and he in turn shared it with me. We live in a time when some of the most enticing images aren’t the ones shoved in front of us by advertisers, but those voluntarily sent by friends and family. Before I knew it a simple joke painted on a wall on the other side of the world inspired me to have a conversation about a bagel shop I would have never heard of otherwise. 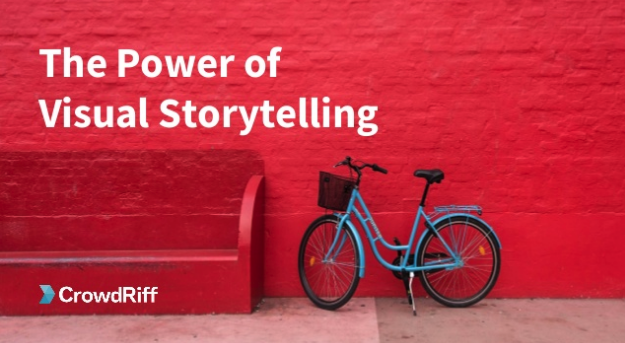 Effective visually storytelling, when executed well, naturally begs to be shared with others. 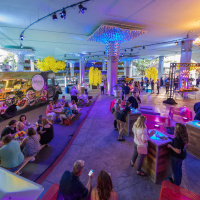 Destination marketers have a rich source of material to use in marketing their destination, but it’s the visual elements that draw an audience into a story and create an emotional connection. As a result, visuals demand as much care and attention as non-visual elements—if not more—as they are what ultimately inspire people to take notice, take action and spread the word to others. Amrita Gurney is the Vice President of Marketing at CrowdRiff, where she leads a team responsible for brand, content, product marketing, and demand generation. Prior to CrowdRiff Amrita ran marketing at high growth startups including Audiobooks.com and Asigra. Amrita loves digital marketing, contemporary art, drinking tea and travelling. You can find Amrita on Twitter @amritagurney. 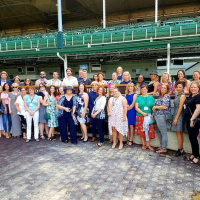 Here are the top highlights and takeaways from Tourism Academy 2018. Enough About the Agenda . . . What About The Parties? Is it time to have fun yet? 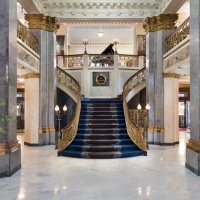 Here's an overview of Tourism Academy's evening entertainment and networking. 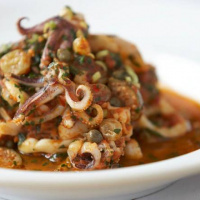 ​One of the best parts about travel is taking the opportunity to experience the culture of each destination, and one of the most fun (and tasty) ways to do that is through food. 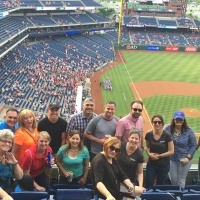 Thank you for hosting our group - we had an amazing time!